Lift-Manager’s roots extend back to 1989. Even before the political turn around in the GDR, Roland Jäkel became self-employed with a workshop in the area of forklifts and mobile cranes. 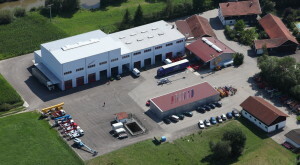 In 1991, this became Roland Jäkel GmbH, Hebezeug und Arbeitsbühnen (Lifting Equipment and Work Platforms) and work platforms from Rothlehner also soon came along. Until 2000, Roland Jäkel GmbH was mainly active as a work platform service partner for Rothlehner Arbeitsbühnen (work platforms) in the German states of Saxony, Berlin, Brandenburg, Saxony-Anhalt and Thuringia. Then changes in the work platform service sector arose as a result of changes in the elevating work platform branch. Hence, 01. Mai 2001, Lift-Manager GmbH was created as the result of a merger with the Rothlehner Arbeitsbühnen GmbH, Service Division. Since then, a work platform service has been organised and carried out across the whole of the Federal Republic of Germany. Lift-Manager began organising the servicing of numerous manufacturers and brands with 35 employees, focusing on the interests of our customers. Today, Lift-Manager is active with more than 60 employees in the field of work platform service, and following further changes in the market, Lift-Manager has also returned step-by-step back into forklift servicing. As an owner-lead company, Lift-Manager places the utmost importance on living its corporate philosophy. Since 1996, we have been a training company for various metal and commercial vocations. We attach great value to new, young recruits as a basis for the long-term success of our company. Lift-Manager not only wishes to ensure the technical safety of elevating work platforms, and has also been a committed member of the International Powered Access Federation (IPAF) for many years, in the area of platform operator and demonstrator training. Thanks to close co-operation with several trade associations, we have also achieved this at a national level. Through the provision of specialist presentations and publications, we are actively involved in the reduction of accident risks in the handling of elevating work platforms. Our certification since 1998 in accordance with ISO 9001 and the trade association „SmS – Sicher mit System“ (Safety with a System) label express of our high demands on quality. In alignment with our maxim, we continue to work on the further development of our company: „Those who stop becoming better, will soon stop being good!“. Thats why we have extended the service capacities for our customers in 2015, by finishing a new 1000m² extension building in Jänkendorf and by opening a new subsidiary in Hannover.